The Washington Post reporters and editors spent their last day in the building they have called home since 1950 with a mix of nostalgia and humor. The Post is moving three blocks from 1150 15th St. NW to 1301 K St. NW. The move has been in the works since the newspaper was bought by Jeff Bezos. The departure from the -- literally -- storied floors was celebrated by a marching band through the newsroom, a graffitti wall ("Mr. Bezos, tear down this wall! "), cupcakes all round, and a reunion that brought back journalistic legends Bob Woodward and Carl Bernstein. There was also a memo that tried to allay fears that a glass railing in the new building would allow peeping Toms on the seventh floor to look up the skirts of women on the eighth floor. The note said an investigation determined that the rumor was unfounded, but nevertheless jokingly ordered those on the seventh floor to "Continue moving forward, maintaining a neutral, almost vacant expression on your face." 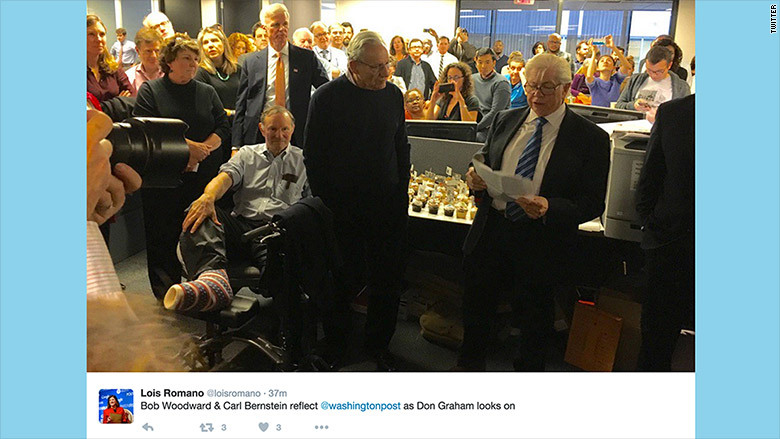 Carl Bernstein stumbles in speech to @washingtonpost newsroom on last day in old HQ. Bob Woodward quips: "You want me to re-write it?"